The Hardware Store! Hillarious World of Warcraft Music Video. Probably the best World of Warcraft video I have seen. Well thought out and executed. Weird Al would be pleased! I played ice hockey last night and I did pretty damn well if I must say so. I had a very rocky start as I gave up my first two shots on net. I blamed my positioning on both of them. Otherwise, I came up with some good butterfly saves, and moved laterally very well. Both myself and the opposing goaltender were pretty damn lucky. My team rang 2 shots off the post on empty net chances with the goalie out of the net to play the puck. Their team rang one off the far post when I was sprawled out on the ice to make a save. I have a few months before I have to decide if I want to play ice hockey on a pickup team for a season next season. If I want to get a start playing ice hockey again, this would be it. I just don’t know if I can handle the late ice times with me working in the morning. The secrets behind Lance Armstrong’s success! University of Texas at Austin College of Education Professor Ed Coyle started a seven-year study in 1992 of cycling phenom Lance Armstrong and learned what makes a superman. As it turns out, it wasnÃ¢ï¿½ï¿½t drugs or any other artificial enhancement…. I went back to look at my past championships because Saturday is still ringing in my head. I still remember how happy I was to win my first championship. My 3rd was my 1st with the Stick Heads and man that one was satisfying. It seems just a year ago when that happened. In all actuality, it was almost 4 years ago. Everything just fell into place for me this time around. I have to remember one key thing though, and that is championships come and go. You can’t be a champion every season. You can’t win every key game. The bounces don’t go your way everytime. There will be dry spells, like the 6 months I waited to get back in the winners circle after the Fury won in Summer of 2005. Groots victory in Spring of 2006 brought me out of my drought, but it was still a long 2 sessions and playoffs until I got back up to the top. Now, I can’t get any farther up. I have achieved more in the last few days than a lot of other players will. Securing 3 more championships to bring my total to 13 is just incredible. Yet, I am still not considered an elite goalie among the people I play against which is what I prefer to be. I would rather be the guy known to be the player who can get it done in the clutch, when 1 game in the playoffs is all you have. I feel I have proved that. I really hope I get an opportunity to three-peat with Groot. If that doesn’t come to pass and I am out of the winners circle again, I just hope I get back in sooner rather than later. I am taking the time to write this on Monday instead of Saturday night or Sunday just to let it all soak in as to what I have accomplished. Groot Builders title defense would start against Team Civgood. Groot notched the first 3 goals of the game very early. Civgood didn’t back down either, even with a very short bench. Groot went on to win by a final of 6-2 to advance to the finals. Dekleine Builders also advanced over the Beavers by a 6-2 final. Both goals scored against me were glove side goals. I dropped my glove on one of the shots and it hit the top corner of the net. The second one I had my glove up on but didn’t get a piece of it as Brandon hit the top part of the net. Both goals were scored by the same guy. As for Dekleine, they really took advantage of their opportunities and was impressed with their passing and their overall play. I skated out for about five shifts for my Dragons team as a forward. I really had some energy, but with two games done and I knew I had 3 in a row coming up with a possibility of getting a 4th game, I didn’t play as much as I wanted to. My worst bruise of the night came during this game when I was hit in the left hip by a shot from the point when I was driving to the net. That bruise still hurts today. I started my 3 games in a row with Biohazard, a team I didn’t play for all season but here I was in the finals getting my shot, vrs Affirmative Action. Biohazard took the game 6-1 and I didn’t face many major chances. The defense was solid as Biohazard cycled the puck around and really just outworked the other team. Groot Builders was the one team I wanted to repeat for. If not for myself, but for everyone else on the team who came back to play again. For Justin who is leaving the country for half a year here in about 2 months. For Dave who has never won a championship before. It was something that I just felt the need to accomplish. That dream didn’t get off to a good start though as Who Cares lept out to a 2-0 lead in the first 3 minutes of the game. One shot was an opportunity when a forward came out from behind the net and backhanded a great shot to the upper corner of the net. The second goal came on a 2 on 1 where my defense didn’t pick up the second player and he scored an easy one timer goal. Other than those two mistakes by the team, that was all they got in the game. Justin and Matt each notched 2 goals a piece, with 1 an empty netter as we repeated as champions with a 4-2 victory. Dekleine Builders was the last of my 3 games in a row and it was against the Fury. Dekleine finished 3rd in the division while the Fury were first so I knew it would be a tough game. Dekleine got on the board first, but it was the fury who got the next two. One of those shots I left the post on and their forward threaded the needle between my side and the post. The other goal was a very nice two on one shorthanded goal I didn’t have a chance at stopping. Dekleine came back to take a one goal lead with less than 5 minutes to play, but the Fury came back to tie it up on a power play. With the game tied 3-3, Dekleine’s shot blocking was really noticable. They really worked hard to make sure their defense couldn’t get anything through. I made a couple saves, but my defense really came through at a key time. The game winning goal fell into place in slow motion. We were pressuring in the offensive zone. Their defense tries to pass the puck up for a fast break. Our defense steals the pass, and passes it down to our forward. Forward shoots the puck and it goes off their own defenseman’s stick and into the top corner of the net. Game was over. As much as I was happy we won 4-3 in OT, I really felt for the Fury. Here was a team that got a great bounce against me in regulation of the regular season to beat me 4-3. Now, in a title game, we got a bounce against them. You could call it karma or luck. I just am going to call it hockey. Why does one team hit 2-3 posts while another one hits the post the same number of times and it still goes in the net? Its hockey. I had a couple hours to rest before my last game of the night which was the title game of Biohazard against….the Dynamo? Yes, the Dynamo. A house team that was 4th in the league that upset the Phantoms, a team that lost 1 time during the season. Maybe they underestimated the Dynamo? Who knows. All I know is that we were playing them for the championship and it was going the Dynamo’s way early. Biohazard got the first goal of the game, but Dynamo got the next three off of either breakaways or odd man rushes. With the game 3-1 and half the game gone by, it didn’t look good. Biohazard then woke up and got 4 goals in the last period to win 5-3. The hardest part of the night was playing 3 games in a row. That included two championship games in a row. As much as I asked other goaltenders to play for me for one of the games, I felt bad because if they did play, my teams would probably be upset. My teams would want me playing even if I was totally exhausted. I have given up games before only to see us lose and then I am really upset with myself for even doing it. I guess things worked out for the best overall, but if I lost one of those championship games, then I would have heard about it from everyone else at the rink for a long time to come. Probably about how tired I was and I should have given the game up to another goaltender. The crappy part was, no one else wanted to play but me. The thing I will remember most about this day was the fact that I was playing for a total of about 5 hours and when I was in goal, I was unbeaten. Partially because of my teams in front of me, but also because of my ability to stop the puck, and a little luck. Back about 2-3 years ago, I won two championships in one playoff day and played 5 games. I thought that was the best day that I would have in playoffs. Now, I have three to my name in a day which brings my total up to 13 championships. The first thing I thought was, unlucky number? I don’t think that way normally, but the last time I won two I had to wait a few season before I got back in the winners circle again in the playoffs. Whats next for me? Groot will return, but with two of their defensive horses gone, they won’t be as strong. Dekleine will return in January after a 2 session break. My Dragons team is returning with me skating out once again. Biohazard asked me to be their goalie for the season coming up. The opportunity to play with those guys again sounds very attractive and their chances to repeat look very good. I guess we will see how I feel in the next few days. Groot added another win last night to move to 9-1 on the season and leading into playoffs on Saturday. I am excited about the opportunity to repeat as a champion and earn my 11th trophy. In addition to that, I have 1 other team that will make it in and 1 on the bubble. Its going to be 80 degrees on Saturday so it will be a hot one to say the least. As the days go on, I am more excited about playing on Saturday. 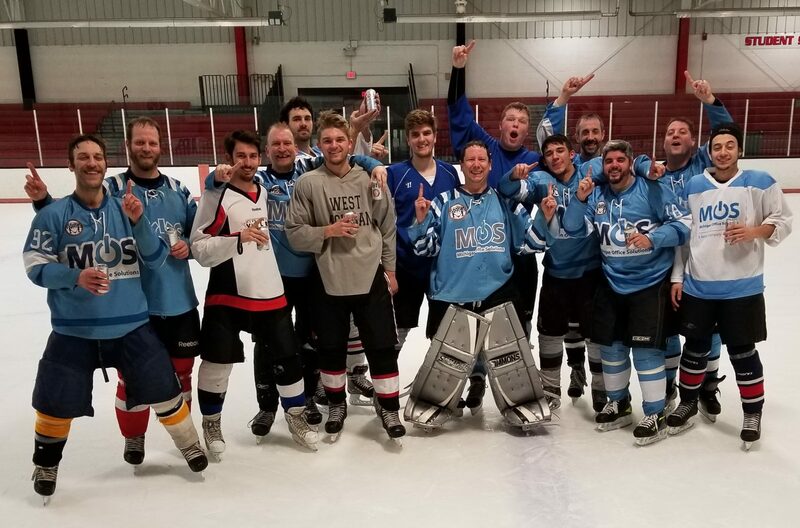 Groot Builders clinched 1st in the division last night with a 5-4 OT victory. With one more game to go before playoffs, we are in a good position. I feel very confident things are going to go well. The only thing I need to do is to keep working on my positioning and stop letting in that one weak goal per game that I seem to be doing again. The first real shot I faced in two weeks went five hole on me and that was a nice little wake up call. I am also wondering how I am going to go into the playoffs next week. Will I be too relaxed? Since I got my 10th championship, I wouldn’t say that I am complacent. I feel more accomplished than anything else. I have to go into the rest of my games with a lot of focus. I have to be ready to play come next week. No excuses. I know, I am posting a few days late, but I wanted to put this in perspective before I said anything on this situation. First off, I am a big hockey fan. I didn’t fall in love with the sport until around 1994, but since then I have followed not only the Red Wings, but other teams. Hockey is the greatest sport in the world in my mind. In addition to following the sport, I play it as well. I just hit 34 and I take the sport rather seriously. This is coming from someone who was never a great athelete in middle/high school or college for that matter. I guess you could say that I dedicated myself to the sport of hockey because I never wanted to be that fan that didn’t know what he was talking about. There are countless fans out there that like hockey, but can’t see plays developing or question what coaches do. I wanted to understand everything or as much as possible. Sometimes I wonder how I will end my playing career. Will I be injured and have to walk away from the game? Will I play until I am in my late 60s? Steve Yzerman walked away from the game he loved a few days ago. I wonder how he is feeling today now that he knows he played his last NHL game. Is he sad? Is he happy? He also said that he has played hockey for the last time unless it is to play with his kids. Is that true? Is it really that easy to walk away from something that you love to do? Case in point, I love computers. If I hit the lotto, I couldn’t just walk away from computers. I would spend more time playing with them in an informal setting. Will Stevie play in rec leagues? Maybe play for charity? It is my hope that he does. I just hope that I am not in a position where I have to leave something I love to do.